Oliver’s Twist, a cocktail bar on Phinney Ridge in Seattle, was one of the places that helped kick off our cocktail obsession – it was the very first place that we ever tasted a Corpse Reviver #2, considered one of the great “gateway” cocktails. That was several years ago, and yet we hadn’t been back. Mostly because the place is always crammed full of hip young things, but still. I guess we got distracted by Liberty and Barrio. Anyway. 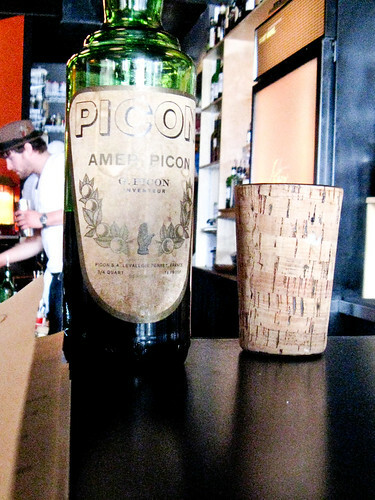 We finally made it back there last week, and the first thing I saw as we settled ourselves at the bar was a slightly weathered looking bottle of Amer Picon. A French bitter liqueur, this stuff is not easy to find these days. It used to be available in the states, and many classic cocktails call for it. But now I hear the only way to get it is to buy it in France, or find a bartender or other cocktail geek with a personal stash and attempt to buy it off of them (good luck). 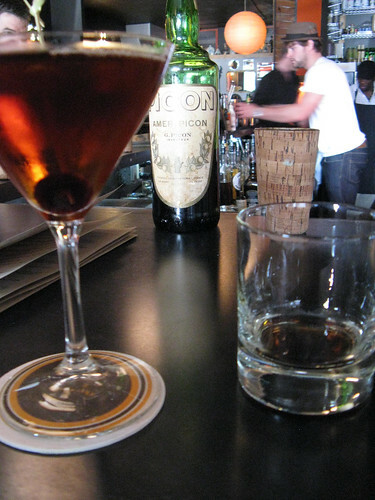 One of our favorite drinks, the Brooklyn, is technically supposed to be made with Picon, but we’ve always used Amaro Nonino as a make-do, and I’d never tried the cocktail made to its original recipe. So when I saw that bottle, my first thought was to ask the bartender for a Brooklyn. His first reaction was to say “I really should hide that bottle” – but then he not only made me a Brooklyn, he also gave me a sip of the Picon so I could experience its taste undiluted. I would have loved to try it side by side with other amari, but it seemed most like Averna to us – lots of caramel and orange, but not too sweet. The cocktail was perfectly balanced and delicious, but didn’t taste extremely different than our adapted version. It was, however, nicely built and quite large. And excellent with truffled popcorn. If we ever have the opportunity to get a bottle of Picon, we definitely will, but I’m reassured to know that the cocktails we make at home are acceptably close. And I can always go back to Oliver’s Twist for a reminder, at least until that bottle runs out.